← Tips to Win Keno Like a Boss! News this week from the United Kingdom stating the arrest of a prominent gaming figure on the charge of fraud has caused quite the stir throughout the gambling industry world-over. UK-based gaming site, which has links to prominent English footballing figure Harry Redknapp as well as two Premier League Clubs, is believed to have committed up to £21million worth of fraud in the form of money laundering. During the investigation some 13 properties were raided, an additional six individuals were arrested on top of Mr Bell and around £1million was seized in cash. 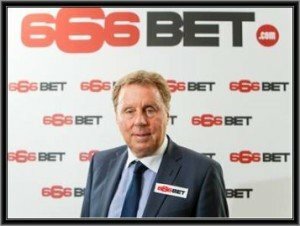 666Bet had begun a rise to prominence within the already heavily saturated UK market in the last year or two, last year penning ad deals with both West Bromwich Albion and Leicester City. As well as this, the company had contracted former Queens Park Rangers manager and onetime England national team prospect Harry Redknapp to appear in a series of television adverts.